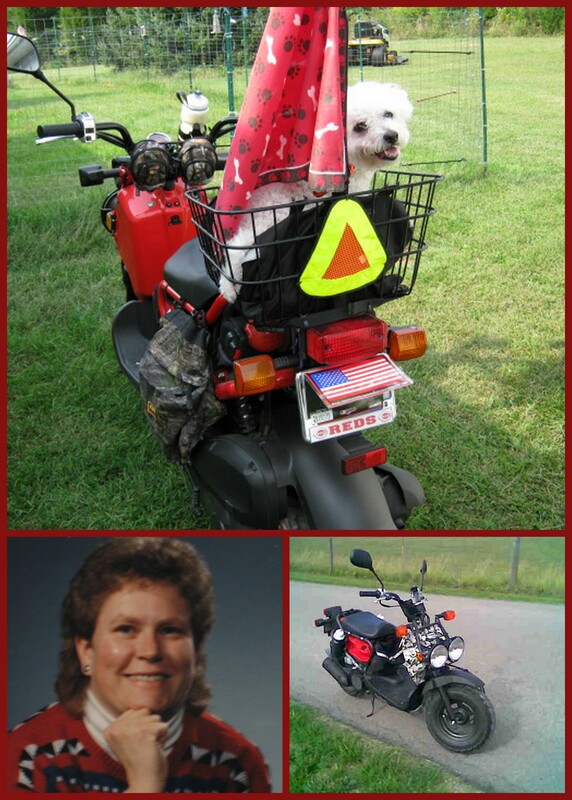 Profile of a Female Motorcyclist: Meet Deb a.k.a. RuckusGal | Helmet or Heels: I'm comfortable in either! So glad you stopped by my blog today. These profiles are so fascinating to read. Can you believe this is number 22 in this series?! Ladies, please let me know if you’d like to join in and share your story. Each are so unique and offer lots of encouragement and wisdom. My next guest is Deb “RuckusGal” from Southern Ohio. She is a self taught rider and blogs about her scootin’ life here on RuckusScooterLove. How long have you been riding a motorcycle? Five years on scooters, a season of riding a motorcycle 20 years before that. How did you learn to ride? I taught myself with a little bit of prompting and a lot of practice! What was your first motorcycle? First motorcycle (and only thus far) was a 1985 Honda Shadow 500cc. First scooter was a 2006 Honda Ruckus 49cc. How many have you owned? Five: 1985 Honda Shadow 500; 2006/2009 Honda Ruckus 49cc; 2001 Honda Elite 80; 2010 Honda Elite 110. Why did you want to ride a motorcycle? Freedom, adventure, FUN! I have always wanted to ride across country ever since seeing that TV show, “Then Came Bronson” and the movie, “Easy Rider” with Peter Fonda. Tell us about your riding. Mostly I’ve been riding scooters, as a solo rider, for pleasure, exploring the rural area around where I live. I have a county map on my wall and I have been highlighting every county road that I have ridden in yellow. I ride everywhere in this county and the ones around me, March through November. I ride also to the grocery store, library, out on photography rides, visiting the neighbors up and down my road, and riding just to get out in nature and “clear the cobwebs.” I’ve also commuted on it to work and school. What advice do you have for women who ride or want to ride a motorcycle? Just go and do it! Don’t be afraid to be different and don’t think you have “all the time in the world.” Life is shorter than we think! Pick a scooter or motorcycle that fits you and your comfort level. Start out easy so that you can build up your confidence and skills. Ride at your own pace and ignore pressure from others. Finally, don’t let age and economics stop you: I started back to riding at age 52 and live frugally. There are affordable new and used bikes out there, so go for it! What is the longest trip that you’ve taken on your cycle? When I rode the motorcycle, probably 200 miles. On the scooter, probably 100 miles. Do you belong to any motorcycle groups? I hang out on Scooter Diva, Total Ruckus, and Scooter Cincinnati on-line. No groups, though I am thinking about starting one out where I live in the “sticks” as there isn’t one. What do you do when you’re not riding? I work out of my home as an educator for a non-profit to keep the scooter fed and watered. I also love to hang out with my dogs, play golf, hike, cook, and read. This entry was posted in Lady Riders and tagged Blogger, Female Motorcyclist, first motorcycle, Honda, motorcycle, Ohio, riding, Scooter, women. Bookmark the permalink. Another day and another wonderful lady rider. And…..another blog to add to my blog roll and follow. Thanks again Pam for sharing all these stories. Hard to believe there have been 22 of so far. Woot its Deb! Honey you don’t need a giant bike to ride with the big doggies! I will ride with you anytime – scoot or motorcycle! Deb, I’ll ride with you, too. And VA isn’t all that far from Ohio! Thanks for sharing your story, Deb!